Hiya guys! You ever have one of those days where you blink and the day has flown by? That's total me right now. I think it's partly due to being excited for Mother's Day weekend. Even though I'm just a fur-mom I'm looking forward to spoiling myself with polishes. No judging guys, I bottle fed all four of my babies so it counts haha. But like always I'm here to enable you to join me this weekend in shopping. 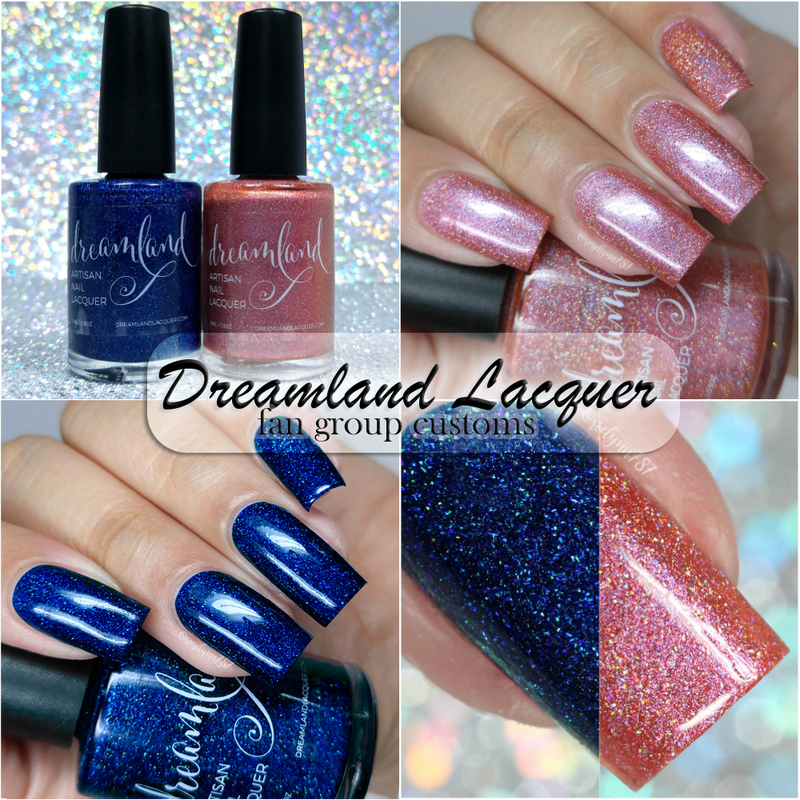 Today I'm sharing swatches for the Fan Group Customs from Dreamland Lacquer, which consists of two holographic beauties. These are releasing along side the Dreamland 5-Year Anniversary Duo, which I'll be sharing with you tomorrow - side tuned! But for now let's go ahead and get into the swatches. The Fan Group Customs by Dreamland Lacquer will be available for pre-order Saturday, May 13th at 2PM CDT through May 20th. You must be a member of the Smitten with Dreamland group on Facebook to order so be sure to join! Also releasing on the same day is the Dreamland 5-Year Anniversary Duo! To celebrate the milestone, the shop will be having a 25% off sale (some exclusions apply) with the code DREAMIT5. In a Mood can be described as a dark blue polish with large and small holographic particles. You guys know I am a lover of anything blue so this one is right up my alley. 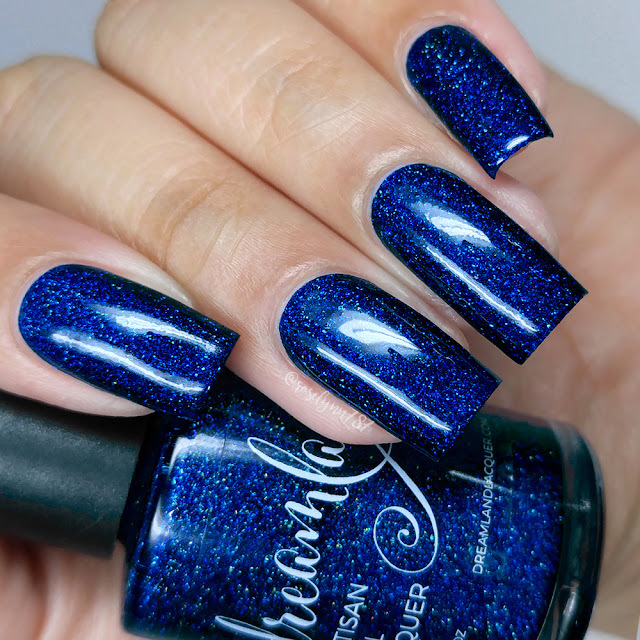 It's so richly pigmented and full of depth, the large and small holo glitters really compliment each other well here. I feel like I could stare at it forever... and honestly I did. Seriously, after my swatch session I ended up wearing this to bed and staring it until I fell asleep haha. It's literally dreamy XD. The formula has a really intense opaque application, almost a one coater. Consistency wise it's very well balanced, not too thick or too thin. I did experience some staining even through a base-coat on removal to my nail bed and also my cuticles. It was not significant and I ended up being able to scrub away the slight hue residue fairly easily. It dries down to a textured finish, but can be smoothed down by doubling up on the topcoat. Shown in two coats and sealed with a glossy topcoat. Middle Distance can be described as a peachy coral polish with slight orange color shift and large and small holographic particles. The holographic finish in this shade is absolutely blinding! Mind you these photos are taken indoors, in a lightbox, and the holo is still so strong. 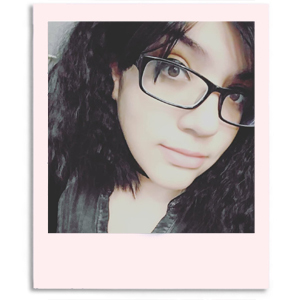 I love how it looks against my skin-tone as well, which is something that rarely happens with a peachy coral. The formula has a very opaque application, but it's not quite a one coater. The consistency leans on the thick side, but it's manageable and easy to work with. It dries down to a slightly gritty finish, but can be smoothed down with topcoat. Shown in two coats and sealed with a glossy topcoat. Overall these are both absolutely stunning beyond belief, but if I have to pick a favorite then it's hands down Middle Distance. That holo though *love sigh* it's breath-taking! I think this is the first time in Manicured and Marvelous history I have picked a must-have over a blue shade in the collection. And it's a coral, yeah guys I already foresee this shade making my top 20 list at the end of the year #callingitnow. It's a really that great of a shade, plus it's totally pulling those spring and summer vibes as well. And if you think these are beautiful just wait until I show you the other duo tomorrow! To recap, the Fan Group Customs by Dreamland Lacquer will be available for pre-order Saturday, May 13th at 2PM CDT through May 20th. You must be a member of the Smitten with Dreamland group on Facebook to order. Also releasing on the same day is the Dreamland 5-Year Anniversary Duo!